We believe It is a woman's nature to love beauty, so you deserve to have this beautiful Magiclove Exclusive Clutch Evening Bag! It is a very female design covered with thousands of rhinestuds. It add more sparkle to your dress and shoes. Impressive ! Classic rectangle shape with new 2 balls clasp , it can fit iphone8 Plus, exquisite size which can be safely hold in hand. 1. Same quality as famous brand. Fully handcrafted . No snagging on clothes, hair. 3. Expensive and gorgeous looking but reasonable price. Everyone can buy it. 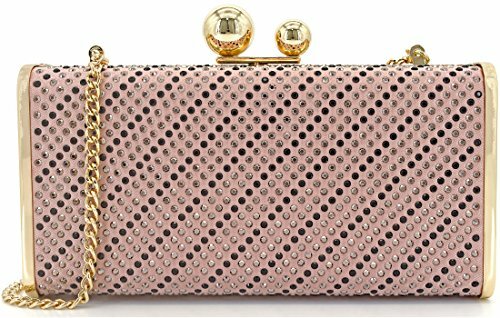 This clutch purse is easy to match everything (such as jewelry, shoes and dress). 4. This bridal handbag comes wrapped in MagicLove protect bag/tissue paper/bubble bag/white gift box. 1. With the difference in measurement method, Please allow 0.2"-0.9" in size error due to manual measurement. 3. Please allow the smell in the course of packing and shipping as it's brand new. But the smell will be gone if place the clutch in freely circulating air for 1-2 days. Accept returns or exchanges if you're not satisfied with it for any reasons or have any problem with the product, please don't hesitate to contact us and tell the problem. We promise that we can give you a good solution within 24 hours. [Material]--This evening bag use Top-grade Rhinestuds, which is very dazzling like a diamond, no blemishes. K gold plating hardware which was carefully selected, no scratch, no rust on the surface. high quality cotton twill lining. [Chain]--with 1pcs detachable metal chain (length at 120cm). you can wear it as shoulder/crossbody strap, or clutch/minaudiere in hand. [Specification]-- 19cm (L)*5cm(W)* 10cm(H), This women clutch purse can fit in iphone8 Plus and small things. [Features]-New 2 Balls push-lock closure which is easy to open & close, also keep your personal stuff safe. Classic rectangle shaped box which is the perfect bag to match your charming jewelry, evening shoes and dress. [Occasions]--cocktail/birthday/prom/wedding party, baby shower, Engagement, Social Activities, nightclub or night out. Great gift for bridal, bridesmaid, women, ladies etc. If you have any questions about this product by MagicLove, contact us by completing and submitting the form below. If you are looking for a specif part number, please include it with your message.